I am about 3/4 or more done my first ever bottle of the Assault pre workout supplement from Muscle Pharm and feel I am now able to do a full, honest review of the product. I have taken numerous pre workout supplements over the years, so I have a pretty good feel of what a good product is and what isn’t. With saying that I would have to say Assault by Muscle Pharm is one of the more elite pre workout supplements out there. Assault is a packed pre workout supplement that is designed to boost your energy in the gym and provide your body with muscle building and fat burning ingredients. Most pre-workout supplements are focusing on energy and focus, but Assault combines that with other key ingredients to ensure your body gets what it needs during your workout. I recommend starting with a half scoop of Assault and working your way up to a full scoop if your stomach can handle it. Assault isn’t harsh on your stomach or anything – the scoops are just very big. 1/2 a scoop is better than most pre workout supplements, but a full scoop provides a ton of great ingredients. After taking Assault for the past 3 weeks or so I can safely say that it is one of my favorite pre workout supplements I’ve had to date. I rate it right up there with SuperPump Max and I will definitely be using it again very soon. 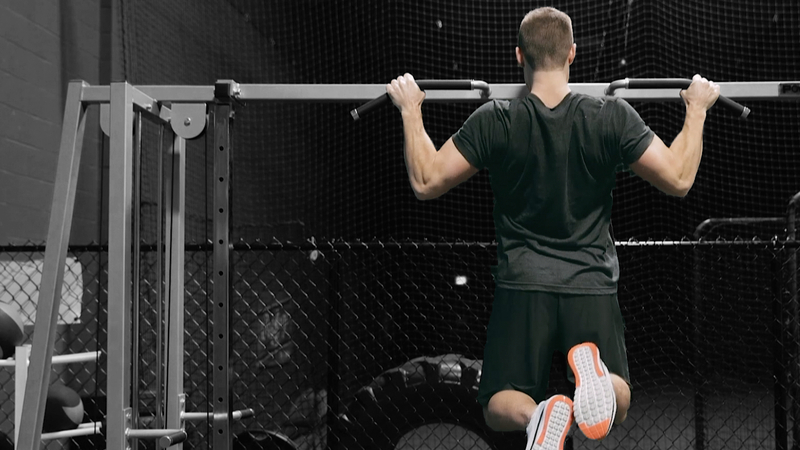 Assault is jam packed with ingredients that are going to help anybody build muscle and burn fat at the same time. If you are taking a full scoop of Assault you will get 6 grams of Branch Chain Amino Acids (BCAAs) which includes a 3:1:2 ratio of leucine isoleucine and valine. You will also get in 5 grams of “con-cret” creatine. This con-cret creatine is a patented version of creatine that is basically the best of the best as far as creatine goes. You will also get the benefits from 4 grams of Beta Alanine. As you can see Assault is full of top notch ingredients that you won’t find in most pre workout supplements. Normally you’d have to buy the BCAAs, Con-cret, and Beta Alanine as separate supplements, but with Assault you get it all-in-one preworkout. Assault has taken out the stimulant 1,3-Dimethylamine that many pre workouts use. This ingredient provides good energy and focus, but leads to crashes after the gym – and nobody likes a brutal crash after a workout. With the ingredients the Assault supplement includes you will get a very nice energy boost preworkout. I’ve had other products give me a bigger boost, but Assault is almost the perfect boost for me (I don’t like getting too jittery) and the no crash is a big thumbs up. Another thumbs up here. Anytime I step in the gym after drinking my Assault I notice huge pumps just a few exercises into my workout. Vascularity is also increased with Assault which I like to see during my workouts. This helps show me that nutrients are getting delivered to where they need to be, and my muscles are going to be growing! I will be the first to admit that I am borderline obsessed with the taste of SuperPump Max Fruit Punch and nothing has ever compared to it for me. Because of that nothing less will ever get rated a 10 out of 10, but I can say that Assault was also good tasting. I wouldn’t go as far as saying it was delicious – but if it was in my fridge as a juice I’d definitely guzzle it down. I have the Blue Artic Raspberry flavor, and the next time I order Assault I am going to go with the Fruit Punch (see update below). I would steer clear of Orange Mango, as I had a buddy tell me it wasn’t the best tasting. Overall Assault Blue Raspberry was good tasting and I had no troubles what so ever drinking it. 9/10. Update – I just got a tub of Fruit Punch and I would rate it a 9.5/10 – Great tasting! I would highly recommend Fruit Punch over any other flavor. Given the quality of the product and the generous amounts of ingredients within the product you’d think that Assault would have jacked their price up. I am happy to say that the Assault jug is just $35 at Bodybuilding.com for 32 servings. It is important to note that the servings are 1/2 scoops, so if you are doing a full scoop you will get 16 workouts for your $35. I usually take BCAAs, Beta Alanine, and Creatine separate from my pre workout, but with having enough of those ingredients within Assault I was able to save money by cutting those out and only taking the Assault supplement. 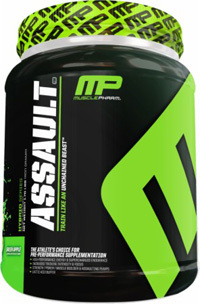 You are truly getting a GREAT DEAL for your dollar here with the Assault supplement – good job Muscle Pharm! You can’t go wrong with Assault and I’ve been recommending it to all of my friends. I may be reviewing some other pre workout supplements, but Assault is one I know I will be going back to soon. Enjoy it and keep working hard in the gym.